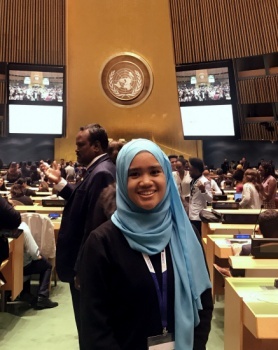 KUANTAN: For three years since she was 15, Nurfarisha Ahmad Fazli nursed the dream to be part of the Youth Assembly at the United Nations (UN) after she saw a posting about the programme on social media. On Feb 14 this year, her dream came true, as she stood on the same stage where Malala Yousafzai, the Pakistani activist she admired for her fight for female education and for being the youngest Nobel Prize laureate, stood in 2013. The Youth Assembly (YA) is a unique platform created to foster dialogue and generate partnerships between exceptional youth, UN high officials and staff, the private sector, and civil society. Realising that attaining her dream would be expensive, the determined Nurfarisha, the eldest of two siblings, said she saved every sen she could, even the money she received on special occasions, including Hari Raya. “I also joined every debate, public speaking and marathon competition where I could earn prize money. Once, I received three boxes of packet drinks at a marathon competition and I sold them to get cash for my trip to the assembly in New York,” she told Bernama recently. The former student of Maktab Rendah Sains MARA (MRSM) Parit in Perak said she filled up the application form online on Nov 17 last year and within a week, received the formal invitation to attend the assembly. The petite teenager from Sungai Soi here said she was asked to choose five out of 17 topics on sustainable development goals (SDGs) set by the UN and to explain her selection. “I listed no-poverty, gender equality, zero hunger, health and well-being, and quality education. These are my areas of interest as I believe no one should go to sleep on an empty stomach, while education is the way to improve the standard of living. “I was also required to write an essay on my contribution to society and I wrote about my experience organising a charity event at a local mosque near MRSM Parit. I was active as part of the student body council, which organised the event, so I wrote about it,” she said. Nurfarisha said both of her parents, Ahmad Fazli Ahmad, 45, a media practitioner and Yusnita Yusoff, 47, a teacher, although initially surprised about her joining the programme, were supportive of her quest. She said her mother took two weeks’ leave from work to accompany her to New York, which made the trip doubly meaningful for mother-daughter bonding. However, her father could not go along due to financial constraints. “The program was held for three days from Feb 14 but we had to depart early because we wanted the cheapest flight tickets. We arrived at New York on Feb 9. “I handled everything from visa application to getting the flights and booking a Airbnb accommodation. This trip was also a sort of birthday present for me as my birthday was Feb 6,” she said. Nurfarisha added the trip to New York was made more special as she got to meet Malaysia’s Permanent Representative to UN Datuk Muhammad Shahrul Ikram Yaakob. Nurfarisha admitted that on the day of the Youth Assembly, she had goosebumps as she first entered the UN’s Hall for the opening session. “I was amazed that some of the speakers were around my age, but were leading charity organisations in their country. It is very inspiring to meet these people,” she said.